The Republic of Uganda ( or ) is a landlocked country in East Africa. It is bordered on the east by Kenya , on the north by Sudan , on the west by the Democratic Republic of the Congo , on the southwest by Rwanda , and on the south by Tanzania. The southern part of the country includes a substantial portion of Lake Victoria , which is also bordered by Kenya and Tanzania. Uganda takes its name from the Buganda kingdom, which encompassed a portion of the south of the country including the capital Kampala . Half of the population of the country lives below the international poverty line of US$1.25 a day. The inhabitants of Uganda were hunter-gatherers until 1,700 to 2,300 years ago. Bantu-speaking populations, who were probably from central and western Africa, migrated to the southern parts of the country. These groups brought and developed ironworking skills and new ideas of social and political organization. The Empire of Kitara in the fourteenth and fifteenth centuries represents the earliest forms of formal organization, followed by the kingdom of Bunyoro-Kitara, and in later centuries, Buganda and Ankole. Nilotic people including Luo and Ateker entered the area from the north, probably beginning about A.D. 120. They were cattle herders and subsistence farmers who settled mainly the northern and eastern parts of the country. Some Luo invaded the area of Bunyoro and assimilated with the Bantu there, establishing the Babiito dynasty of the current Omukama (ruler) of Bunyoro-Kitara. Luo migration continued until the 16th century, with some Luo settling amid Bantu people in Eastern Uganda, with others proceeding to the western shores of Lake Victoria in Kenya and Tanzania. The Ateker (Karimojong and Iteso) settled in the northeastern and eastern parts of the country, and some fused with the Luo in the area north of Lake Kyoga . Arab traders moved inland from the Indian Ocean coast of East Africa in the 1830s. They were followed in the 1860s by British explorers searching for the source of the Nile. Protestant missionaries entered the country in 1877, followed by Catholic missionaries in 1879. The United Kingdom placed the area under the charter of the British East Africa Company in 1888, and ruled it as a protectorate from 1894. As several other territories and chiefdoms were integrated, the final protectorate called Uganda took shape in 1914. From 1900 to 1920, a sleeping sickness epidemic killed more than 250,000 people. The constitution was amended in 1963 to satisfy an alliance between the Uganda People's Congress and the Kabaka Yekka Party, during the elections in 1962. This created a post of a titular Head of State called the President and a position of a Vice President. The UPC government appointed Edward Muteesa II, Kabaka (King) of Buganda, as the President and Commander in Chief of the armed forces. William Wilberforce Nadiope, the Kyabazing of Busoga (paramount chief), was appointed Vice President. In 1966, Milton Obote overthrew the king. A UPC-dominated Parliament changed the constitution, and Obote became president. The elections were suspended, ushering in an era of coups and counter-coups, which would last until the mid-1980s. Obote was deposed twice from office, both times by military coup. Obote's regime was armed by the Soviet Union . Neighboring Tanzania was an outpost of the People's Republic of China and Soviets attempted to control Uganda in order to counter Chinese influence. Idi Amin (1925-2003) seized power in 1971, ruling the country with the military for the next eight years. His regime was armed by Libyan dictator Muammar Gaddafi who saw Amin as a promising fellow Muslim, until the Soviet Union became the primary partner. Amin's rule cost an estimated 300,000 Ugandans' lives. He forcibly removed the entrepreneurial Indian minority from Uganda. The Ugandan economy was devastated. His reign was ended after the Uganda-Tanzania War in 1979 in which Tanzanian forces aided by Ugandan exiles invaded Uganda. This led to the return of Obote, who was deposed once more in 1985 by General Tito Okello. Okello ruled for six months until he was deposed after the so called "bush war" by the National Resistance Army (NRM) operating under the leadership of the current president, Yoweri Museveni, and various rebel groups, including the Federal Democratic Movement of Andrew Kayiira, and another belonging to John Nkwanga. Museveni has been in power since 1986. In the mid to late 1990s, he was lauded by the West as part of a new generation of African leaders. His presidency has included involvement in the civil war in the Democratic Republic of Congo (DRC) and other conflicts in the Great Lakes region , as well as the civil war against the Lord's Resistance Army, which has been guilty of numerous crimes against humanity including child slavery and mass murder. Conflict in northern Uganda has killed thousands and displaced millions. In 2007, Uganda deployed soldiers to the African Union peacekeeping mission in Somalia . The President of Uganda, currently Yoweri kaguta Museveni, is both head of state and head of government. The president appoints a prime minister, currently Apolo Nsibambi, who aids him in governing. The parliament is formed by the National Assembly, which has 332 members. 104 of these members are nominated by interest groups, including women and the army. The remaining members are elected for four year terms during general elections. In a measure ostensibly designed to reduce sectarian violence, political parties were restricted in their activities from 1986. In the non-party "Movement" system instituted by Museveni, political parties continued to exist, but they could only operate a headquarters office. They could not open branches, hold rallies or field candidates directly (although electoral candidates could belong to political parties). A constitutional referendum canceled this nineteen-year ban on multi-party politics in July 2005. Additionally, the time limit for president was changed in the constitution from the two-term limit in order to enable the current president to continue in active politics. The presidential elections were held in February, 2006. Yoweri Museveni, ran against several candidates, the most prominent of whom was exiled Dr. Kizza Besigye. The country is located on the East African plateau, averaging about 1100 metres (3,250 ft) above sea level, and this slopes very steadily downwards to the Sudanese Plain to the north. However, much of the south is poorly drained, while the centre is dominated by Lake Kyoga , which is also surrounded by extensive marshy areas. Uganda lies almost completely within the Nile basin. The Victoria Nile drains from the lake into Lake Kyoga and thence into Lake Albert on the Congolese border. It then runs northwards into Sudan . One small area on the eastern edge of Uganda is drained by the Turkwel river, part of the internal drainage basin of Lake Turkana . Lake Kyoga serves as a rough boundary between Bantu speakers in the south and Nilotic and Central Sudanic language speakers in the north. Despite the division between north and south in political affairs, this linguistic boundary actually runs roughly from northwest to southeast, near the course of the Nile. However, many Ugandans live among people who speak different languages, especially in rural areas. Some sources describe regional variation in terms of physical characteristics, clothing, bodily adornment, and mannerisms, but others claim that those differences are disappearing. Although generally equatorial, the climate is not uniform as the altitude modifies the climate. Southern Uganda is wetter with rain generally spread throughout the year. At Entebbe on the northern shore of Lake Victoria , most rain falls from March to June and the November/December period. Further to the north a dry season gradually emerges; at Gulu about 120 km from the Sudanese border, November to February is much drier than the rest of the year. The northeastern Karamoja region has the driest climate and is prone to droughts in some years. Rwenzori in the southwest on the border with Congo (DRC) receives heavy rain all year round.The south of the country is heavily influenced by one of the world's biggest lakes, Lake Victoria, which contains many islands. It prevents temperatures from varying significantly and increases cloudiness and rainfall. 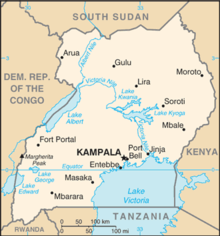 Most important cities are located in the south, near Lake Victoria, including the capital Kampala and the nearby city of Entebbe . Although landlocked, Uganda contains many large lakes, besides Lake Victoria and Lake Kyoga , there are Lake Albert , Lake Edward and the smaller Lake George. Uganda is divided into 77 districts, spread across four administrative regions: Northern, Eastern, Central and Western. The districts are subdivided into counties. A number of districts have been added in the past few years, and eight others were added on July 1, 2006. Most districts are named after their main commercial and administrative towns. Each district is divided into sub-districts, counties, sub-counties, parishes and villages. Parallel with the state administration, six traditional Bantu kingdoms have remained, enjoying some degrees of mainly cultural autonomy. The kingdoms are Toro, Ankole, Busoga, Bunyoro, Buganda and Rwenzururu. For decades, Uganda's economy suffered from devastating economic policies and instability, leaving Uganda as one of the world's poorest countries. The country has commenced economic reforms and growth has been robust. In 2008, Uganda recorded 7% growth despite the global downturn and regional instability. Uganda has substantial natural resources, including fertile soils, regular rainfall, and sizable mineral deposits of copper and cobalt. The country has largely untapped reserves of both crude oil and natural gas. While agriculture used to account for 56% of the economy in 1986, with coffee as its main export, it has now been surpassed by the Services sector, which accounted for 52% of percent GDP in 2007. In the 1950s the British Colonial regime encouraged some 500,000 subsistence farmers to join co-operatives. Since 1986, the government (with the support of foreign countries and international agencies) has acted to rehabilitate an economy devastated during the regime of Idi Amin and subsequent civil war. Inflation ran at 240% in 1987 and 42% in June 1992, and was 5.1% in 2003. Between 1990 and 2001, the economy grew because of continued investment in the rehabilitation of infrastructure, improved incentives for production and exports, reduced inflation, gradually improved domestic security, and the return of exiled Indian-Ugandan entrepreneurs between 1990 and 2001. Ongoing Ugandan involvement in the war in the Democratic Republic of the Congo, corruption within the government, and slippage in the government's determination to press reforms raise doubts about the continuation of strong growth. In 2000, Uganda qualified for the enhanced Heavily Indebted Poor Countries (HIPC) debt relief initiative worth $1.3 billion and Paris Club debt relief worth $145 million. These amounts combined with the original HIPC debt relief added up to about $2 billion. Growth for 2001 - 2002 was solid despite continued decline in the price of coffee, Uganda's principal export. According to IMF statistics, in 2004 Uganda's GDP per capita reached $300, a much higher level than in the 1980s but still at half the Sub-Saharan African average income of $600 per year. Total GDP crossed the 8 billion dollar mark in the same year. With the Uganda securities exchanges established in 1996, several equities have been listed. The Government has used the stock market as an avenue for privatisation. All Government treasury issues are listed on the securities exchange. The Capital Markets Authority has licensed 18 brokers, asset managers and investment advisors including names like African Alliance, AIG Investments, Renaissance Capital and SIMMS. As one of the ways of increasing formal domestic savings, Pension sector reform is the centre of attention (2007). Uganda depends on Kenya for access to international markets. Uganda is part of the East African Community and a potential member of the planned East African Federation. Uganda is home to many different ethnic groups, none of whom forms a majority of the population. Around forty different languages are regularly and currently in use in the country. English became the official language of Uganda after independence. Ugandan English has a local flavour. The most widely locally spoken language in Uganda is Luganda spoken predominantly in the urban concentrations of Kampala, the capital city, and in towns and localities in the Buganda region of Uganda which encompasses Kampala . The Lusoga and Runyankore languages follow, spoken predominantly in the southeastern and southwestern parts of Uganda respectively. Swahili, a widely used language throughout eastern and central east Africa, was approved as the country's second official national language in 2005, though this is somewhat politically sensitive. Though the language has not been favoured by the Bantu-speaking populations of the south and southwest of the country, it is an important lingua franca in the northern regions. It is also widely used in the police and military forces, which may be a historical result of the disproportionate recruitment of northerners into the security forces during the colonial period. The status of Swahili has thus alternated with the political group in power. For example, Amin, who came from the northwest, declared Swahili to be the national language. The current estimated population of Uganda is 32.4 million. Uganda has a very young population, with a median age of 15 years. According to the census of 2002, Christians made up about 84% of Uganda's population. The Roman Catholic Church has the largest number of adherents (41.9%), followed by the Anglican Church of Uganda (35.9%). The next most reported religion of Uganda is Islam, with Muslims representing 12% of the population. The census lists only 1% of Uganda's population as following traditional religions, and 0.7% are classified as 'other non-Christians,' including adherents of sects. Judaism is also practiced in Uganda by a small number of native Ugandans known as the Abayudaya. One of the world's seven Bahá'í Houses of Worship is located on the outskirts of Kampala. See also Bahá'í Faith in Uganda. According to the World Refugee Survey 2008, published by the U.S. Committee for Refugees and Immigrants, Uganda hosted a population of refugees and asylum seekers numbering 235,800 in 2007. The majority of this population came from Sudan (162,100 persons), but also included refugees and asylum seekers from the Democratic Republic of the Congo (41,800), Rwanda (21,200), Somalia (5,700) and Burundi (3,100). Of the Christian population, the Roman Catholic Church has the largest number of followers, followed by the Anglican Church, while Evangelical and Pentecostal churches claim the rest. Evangelical and Pentecostal churches are very active. The Muslim population is primarily Sunni. Traditional indigenous beliefs are practiced in some rural areas and are sometimes blended with or practiced alongside Christianity or Islam. Indian nationals are the most significant immigrant population; members of this community are primarily Ismaili (Shi'a Muslim followers of the Aga Khan) or Hindu. The northern and West Nile regions are predominantly Catholic, while Iganga District in eastern Uganda has the highest percentage of Muslims. The rest of the country has a mix of religious affiliations. Uganda has been among the rare HIV success stories, one of the reasons being openness. Infant mortality rate was at 79 per 1,000 in 2005. Life expectancy was at 50.2 for females, and 49.1 for males in 2005. There were 8 physicians per 100,000 persons in the early 2000s. Owing to the large number of communities, culture within Uganda is diverse. Many Asians (mostly from India) who were expelled during the regime of Amin have returned to Uganda. Cricket has experienced rapid growth although football is the most popular sport in Uganda. Recently in the Quadrangular Tournament in Kenya, Uganda came in as the underdogs and went on to register a historic win against archrivals Kenya. Uganda also won the World Cricket League (WCL) Division 3 and came fourth place in the WCL Division 2. In February 2009, Uganda finished as runner-up in the WCL Division 3 competition held in Argentina, thus gaining a place in the World Cup Qualifier held in South Africa in April 2009.In 2007 the Ugandan Rugby Union team were victorious in the 2007 Africa Cup, beating Madagascar in the final. Rallying is also a popular sport in Uganda with the country having successfully staged a round of the African Rally Championship (ARC), Pearl of Africa Rally since 1996 when it was a candidate event. The country has gone on to produce African rally champions such as Charles Muhangi who won the 1999 ARC crown. Other notable Ugandans on the African rally scene include the late Riyaz Kurji who was killed in an fatal accident while leading the 2009 edition, Emma Katto, Karim Hirji, Chipper Adams and Charles Lubega. Ugandans have also featured prominently in the Safari Rally. Ugandans have since the early twenties enjoyed the fast-paced sport of hockey. It was originally played by the Asians, but now it is widely played by people from other racial backgrounds. Hockey is the only Ugandan field sport to date to have qualified for and represented the country at the Olympics; this was at the Munich games in 1972. It is also believed in Ugandan hockey circles that Uganda's first and only Olympic gold medal may have been realized in part by the cheers from the representative hockey team that urged John Akii-Bua forward. Illiteracy is common in Uganda, particularly among females. Public spending on education was at 5.2 % of the 2002-2005 GDP.Uganda has both private and public universities. Respect for human rights in Uganda has been advanced significantly since the mid-1980s. There are, however, numerous areas which continue to attract concern. Conflict in the northern parts of the country continues to generate reports of abuses by both the rebel Lord's Resistance Army and the Ugandan army. A UN official blamed the LRA in February 2009 of "appalling brutality" in the Democratic Republic of Congo. The number of internally displaced persons is estimated at 1.4 million. Torture continues to be a widespread practice amongst security organizations. Attacks on political freedom in the country, including the arrest and beating of opposition Members of Parliament, has led to international criticism, culminating in May 2005 in a decision by the British government to withhold part of its aid to the country. The arrest of the main opposition leader Kizza Besigye and the besiegement of the High Court during a hearing of Besigye's case by a heavily armed security forces — before the February 2006 elections — led to condemnation. Recently, grassroots organizations have been attempting to raise awareness about the children who were kidnapped by the Lord's Resistance Army to work as soldiers or be used as wives. Thousands of children as young as eight were captured and forced to kill. The documentary film Invisible Children illustrates the terrible lives of the children, known as night commuters, who still to this day leave their villages and walk many miles each night to avoid abduction. In October 2009, a bill was tabled in the Parliament of Uganda entitled "The Anti-Homosexuality Bill 2009" calling for harsher penalties for homosexuals, up to and including the death penalty. This law also requires that any citizen who suspects another person of being homosexual, is required to report the homosexual to police, or they too may receive a fine or time in prison. The proposed bill goes so far as to forbid landlords from renting to a known homosexual, and would ban any public discussion of homosexuality. The U.S. Committee for Refugees and Immigrants reported several violations of refugee rights in 2007, including forcible deportations by the Ugandan government and violence directed against refugees. Phyllis Martin and Patrick O'Meara. Africa. 3rd edition. Indiana University Press, 1995. Mwambutsya, Ndebesa, " Pre-capitalist Social Formation: The Case of the Banyankole of Southwestern Uganda." Eastern Africa Social Science Research Review 6, no. 2; 7, no. 1 (June 1990 and January 1991): 78-95. Reanalyzing the 1900-1920 sleeping sickness epidemic in Uganda.(Perspectives). Emerging Infectious Diseases.
" UK Indians taking care of business". Theage.com.au. March 8, 2006. "Uganda's oil rush: Derricks in the darkness", The Economist, August 6th 2009, retrieved August 10th 2009. Kaujju, Peter. " Capital markets eye pension reform". The New Vision, June, 2008. Retrieved on February 9, 2009. Rutaagi, Edgar. " Uganda Moving Towards Pension Reforms". The African Executive, 2009. Retrieved on February 9, 2009.